The Feldenkrais method works through the nervous system and our own body's innate ability to learn. Your intelligence doesn't stop at the base of your skull. It extends through your spinal column, and throughout your millions of nerves in a graceful, electric dance of information throughout your body. By learning to move in new ways, new possibilities are opened up throughout the whole nervous system--body and mind. 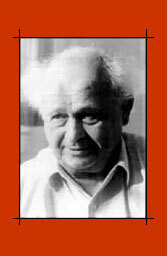 Moshe Feldenkrais D. Sc. (1904-1984), a celebrated mechanical engineer, atomic physicist, and martial artist, suffered in mid-life from a painful knee injury. He resolved to heal his knee and undertook a massive study of human function including anatomy, physiology, growth and development, and psychology. Through experimentation he discovered how to manipulate his knee to restore function. As these tests led to success in his own recovery, he turned to teaching others to heal themselves: the Feldenkrais Method was born. "...life is not a stable process. Stability is for trees. For us, life is a process of risk and recovery. Each step we take is a risk. [Our] ability to recover is our greatest quality. "